Get track lighting the fast and easy way with this complete track kit fixture that has four adjustable lights and a handsome oil-rubbed bronze finish. Looking to kitchen track lighting that used regular bulbs. Just the right size for a recessed area in my kitchen, replacing fluorescent light! I already have one. I wanted a matching set. Only ceiling light we could find. Flexible lighting. Design neutral enough to go with other fixtures. to replace a previous lamp, very similar in style in my kitchen, ordered in 2011 from LampPlus, the lampshades kept falling off and crashing, had replacement lamp shades, now used up all spares and need to replace the 2 lamps in the kitchen. Just hope these are better. I am replacing a small, silver 3-light fixture over the fireplace. It's too small, and we prefer a bronze finish. The four lights in this new fixture will be perfect for that space, and help illuminate the mantel and surrounding features. And the sale price can't be beat! Match other fixtures and ceiling height restrictions. It was flexible and matched my other fixture. Remodeling home with a single light in kitchen. Need to direct lights in different directions. We've purchased previously from Lamps Plus, we love the designs, they arrive successfully and install well. Does this model take led lights? Yes. I am currently using my Phillips Hue lamps in it. This model takes LED lights. Can the mounting box slide on the track for a junction box that is not centered? BEST ANSWER: Hi Tom - No, the box is centered and stationary. Can this light be mounted on a vaulted ceiling? BEST ANSWER: Hi - Yes this can be mounted on a sloped ceiling. Can this light be wall mounted? Is the "amber" glass a yellow tint or is it white? BEST ANSWER: It offers a warm glow. Does the light bulb stick out of the amber glass cover? 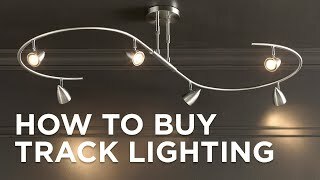 What is the return policy for your lighting? Do I have topay shipping if the lights do not work with my kitchen design. BEST ANSWER: Hi! We have a 60-day return policy. You will need to pay return shipping on this item if it does not fit with your kitchen design. Read our full policy at the link below, or contact us for more information. BEST ANSWER: Absolutely! I do and it’s stated on the box. The fixture fit nicely and looked very nice except I had to return two. The first one because one of the posts coming from the plate on the ceiling was shorter than the other so the fixture was crooked. [...] The second came and one of the posts attached to one of the glass shades was crooked making that particular shade crooked. Again, it was returned[...] But twice was enough. I purchased this for my split stairwell to my basement. I have 2 bulbs aimed up one side of the stairwell, and 2 aimed down the other half. It is a very good solution for lighting up our otherwise dark stairwell. Ordered online - not pkg'ed so great, rec'd 2 broken domes - but getting replacements was not a problem. I would recommend purchasing bulbs that don't have any writing on them, as the bulbs are more exposed than I thought they would be and the brand and wattage written on each bulb cheapens the look of the fixture. Small fingers make changing bulbs much easier. Bought it for a hallway. Really like the design and the adjustable lights, but finish was disappointing. It's described as "oil-rubbed bronze" finish & looks it in the photos--it's just dark brown, shiny paint. Also, the "crackle finish" on the globes is more like glued on sand that looks mottled and kind of dirty. Once installed, my husband said "it's ours now." Guess that means we're keeping it. Our 9-yr-old son thinks it's cool! These light fixtures are a very good value and are very attractive; They gave our kitchen an updated look. We were very pleased with the quality. It arrived in good condition; however, I didn't like that they just left it in front of my door w/o anyone to sign for it. I love this track light. It's excellent quality, looks great, and gives off really good illumination. I installed two of these in my kitchen and the difference in light is amazing. You can direct them any angle you want and they are so stylish that they add so much to wherever you put them. I used this fixture in my kitchen to light the stove and sink area.The individual lights can be pointed to a specific area.I used a dimmer switch for when I dont want the light so bright.This fixture is great looking and is close to the ceiling making the room look bigger. Remodeled our kitchen and needed a light over the sink (full size window with cabinets on either side). This fixture looked a little large when it came in, but we installed a dimmer switch for it and it's beautiful and very functional. Easy to install and is adjustable, looked good, regular size light bulbs stick out of shades. The lights are more yellowish than I thought. The fixture is very heavy, not trivial to install on the ceiling. I wanted to return it, but it was too much hassle to take it down. So I guess we will live with it. We bought the silver version of this light for our living room. It was much lighter and brighter as well. Great product for a kitchen update! I have not installed my light fixture yet, but I did take it out of the box and I am very pleased with how it looks! It is just beautiful. Looks even better in person. I was also pleased with the price, and was delivered super fast. I am hoping to have it installed in a week or so. Very excited! The lights not only are adjustable to shine on the areas you wish to highlight but also give a nice ambience to the rest of the room. 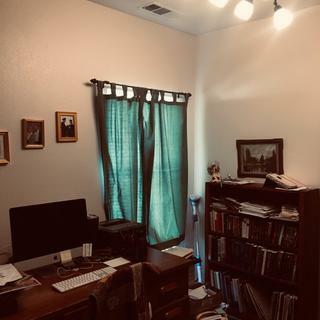 I love the way this light softly illuminates my work area in the Master Bedroom. This light is wonderful! It is so beautiful in our kitchen, we love it. It provides such a warm light. Delivery was on time and arrived damage-free in double-boxed container. Very sturdy well built light. Easy to install. Great finish. The first thing I really like is it uses standard medium (E26) socket, easier and cheaper to find the bulbs. Almost all other track lights use MR16 type bulbs which give narrower beams and cannot make use of the reflection from ceiling. Halogen MR16 bulb is ok as the back is usually allow some light leadking. LED MR16 will not work, as all of them have solid non-transparent back reflectors. Using standard E26 socket is the main reason I picked this lamp, or the reason I didn't consider others. I also like the glass shades, when it's off, it's yellowish color. When it turns on, it goes with what color of the light you use. It glows as white when I used 5000K bulb on it. I'm planning to use 4000K as it's installed for kitchen. Even though it uses standard E26 socket, the lamp shades are short. So, if you use the most common A19 shape bulb, it will be might half inch longer than the shade. You can either to find smaller bulbs (which is not common for LED or CFL) or use incandescent bulb which they are clear so they will still look ok. But if you uses LED or CFL regular shape bulbs, those bulbs are usually in white glasses so they don't match well with the shade color when the light is off (not a problem when it's on, the shades will glow as the same color as the bulbs). Certainly, it wasn't designed at the time to be energy efficient to use LED or CFL. Using LED or CFL bulb has another major drawback. Those bulb are much heavier than incandescent light bulb. I tried some very good and well built CREE LED bulbs on it. No matter how tight I turned the holding screws, the shades couldn't stay in place if I just lightly pushed the fixture. With my 8ft ceiling kitchen, I much prefer to tilt the shades up to have more head room. Last is the finish of the lamp. While I like the glass shade, I don't really consider the fixture itself is "Bronze", it's just some cheap looking semi-gloss brown paint. Used as ceiling lights in family room. Provides great illumination. Easy to install. I wish the lights had more range of motion to direct the light to different areas of the room. It gives great light and we added a dimmer switch. Add direct lighting anywhere in the home with this Juno track bullet featuring a 90 degree vertical aiming capability and convenient 358 degree rotation. Elegant scroll details and a wavy amber glass design gives this stunning 3-light track fixture traditional appeal.